1:12 Scale - While uncommon a number of manufacturers have produced highly detailed model cars in this very large scale. 1:18 Scale - The most common scale for "large" diecast models. Made popular by brands such as Bburago, Maisto, AutoArt and Biante Classics. 1:24 Scale - Previously a very popular scale for larger models which has reduced in popularity of late. Very close to the scale of garden model railways and collector dolls houses. 1:32 Scale - A common scale for Slot Cars. 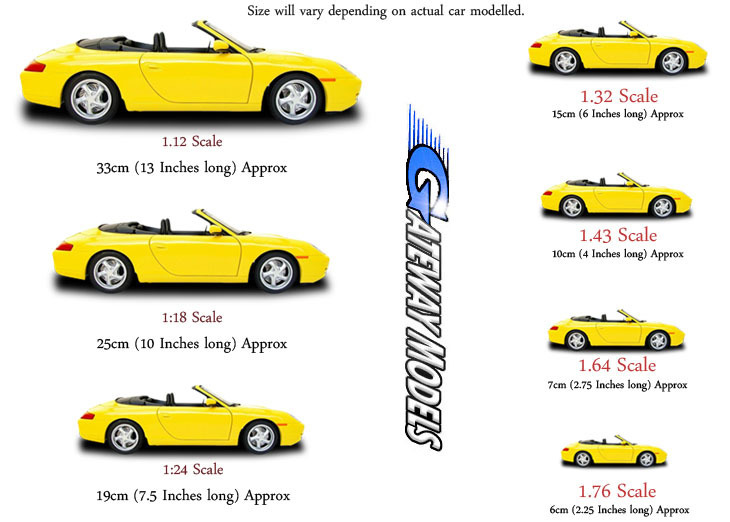 1:43 Scale - The most popular scale for diecast model cars. Traditionally known as the "Collectors Scale" it allows for a good mix of detail and price. 1:50 Scale - A common scale for earhtmoving and truck models. 1:76 Scale - Very close in size to HO/OO scale popular in model railways.